Chie and Erika came back to London today which made me very pleased. I got the train back to London this morning. I had originally hoped my Dartmoor pub exploration might be at least a two day jaunt, but after the lovely spring day yesterday the weather forecast had been pretty dire for today and the remainder of the weekend (and it proved fairly accurate) so before I'd even come down to Devon I'd already abandoned any plans to do any more than the one day. Instead today we had a potter around Dawlish for a short while around lunchtime, which was a good illustration of what a bad idea it would have been to attempt anything outdoorsy on Dartmoor today - even in the relatively short period we spent walking round the town, in the midst of civilisation, it felt really cold and wet and I wanted to just go back inside for a nice warm cup of tea. We did however take a quick look at a cottage I've had my eye on, which is currently for sale - albeit that we could only look at the outside, as were were unable to arrange a viewing for today. As with all of my whims about buying a holiday home I doubt very much that anything will come of it, but this place has quite a draw for me given that it's in the same little row of thatched cottages as the one Vera owned for a few years. Erika said several times she'd like a pink house, near the beach, and this fills both of those criteria perfectly - plus there's a particular sentimental attachment with Dawlish - and this little row of cottages - in that it's where I often went for bucket and spade holidays in my childhood... but of course on the flip side, with Dad living nearby, we can already come to visit the area whenever we want. We are in the fortunate position of a holiday home not being a pipe dream but actually being something we can realistically afford - at least partly because we have such a modest sized place in London, no bigger than we need for the three of us. I know I've probably said it before, but I'm really reluctant to pour more money into the London property market, as it's such poor value, and there's so many better things we could do with the cash. The cost of this house in Dawlish in particular is roughly the same as what we'd have to pay in our part of London just to get a spare bedroom. I'm left in quite a quandary as to what to do. I feel quite a burden of responsibility as a joint custodian of Erika's childhood - I think most people's earliest memories are from around the age of four, which she's just coming up to now. Our flat in London is very much a functional compromise, chosen for all the usual banal reasons of locations of offices and schools, whilst trying to minimise the amount of cash we had to shovel onto the London property bonfire. It's nice to own our own place, and it has a bit of character I suppose, but presumably we'd move as soon as work/school requires us to be somewhere else, and maybe I'm wrong but it's really hard to imagine that it's somewhere any of us will get all misty eyed and nostalgic about in years to come. I guess the idea of a holiday home is as much to do with continuity - somewhere we could keep even if we have to move around in London - and somewhere we might hopefully have more of an emotional attachment to than an overpriced shoebox in a grimy part of London. We spent the remainder of the afternoon back at Dad's house, drinking endless cups of tea. In the evening Dad and I collaborated on dinner, and made a selection of Indian dishes. The last time I'd had a bit of time to myself, when Chie and Erika were in Japan last October, I went on a bit of an adventure to Italy, and had a marvellous time of it. So this time round, having returned from Japan ahead of the girls, I wanted to take advantage of the long Easter weekend for another bit of a jaunt, albeit perhaps a bit less ambitious given the shorter period of time available. I'd spent a while mulling it over, and eventually settled on an idea driven by the quest for quaint - some unfinished business since before Christmas. Andrew at work had demanded a quaint pub crawl in the run up to Christmas for the second year running, and on the most recent attempt we'd gone as far out as Oxford, only to then realise the pubs there weren't really hitting the top end of the quaint scale. Of course, to get to maximum levels of quaint, you need to go rural - and so since December I'd had a gnawing urge to get really out into the depths of the countryside to find some maximally quaint pubs. And so I rose early this morning, and was on the 8am train out of Paddington, bound for Exeter. From there I took a surprisingly nice bus journey (it was a double decker, the views were very pleasant) in the direction of Okehampton, and got off just before we got there, at a middle-of-nowhere road junction called Tongue End Cross, which was the closest the bus went to Belstone, the first point of call on my meticulously planned route. It's actually quite a logistical challenge planning a pub crawl on Dartmoor - most of the pubs are of course pretty spread out, public transport is very limited, and hiring a car would of course rather defeat the object. However I found one handy corner in the North East of the moor - Belstone, Sticklepath and South Zeal - where in those three villages there are five pubs, and there's only about three or four miles of walking involved. I had been to Belstone a couple of times before - most notably at the end of an epic cross moor hike with Dad, having started at Two Bridges, and camped wild somewhere in the middle. I was a teenager, so it must have been over 20 years ago. More recently I went with Chie (on a trip to Dartmoor in 2003), and from that visit I had an image in my head of the beer garden at the Tors Inn, with views straight out onto the hills which form the edge of the wild moor. The Tors Inn certainly isn't the most attractive pub on Dartmoor in terms of the building itself, but the beer garden is spectacular, especially given the lovely weather we were having today (which, as almost everyone I heard commenting on it, was going be for today only - the forecast for tomorrow was dire). So I had my inaugural pint and a ploughman's lunch sitting on one of the picnic benches outside the Tors Inn, admiring the view, and enjoying the delightful spring weather. From there, I followed the Tarka Trail along the Taw River, a section known as Belstone Cleave, which is a very pleasant wooded gorge, and on a day like today was rather idyllic. I think it's just under 3 miles, and took around an hour. So at just gone 2 o' clock I arrived in Sticklepath, and once there headed straight to pub number 2, the Taw River Inn. I almost felt ever so slightly sorry for the Taw River Inn, it's a perfectly decent pub, with incredibly cheap beer (£2.60 a pint!) but I somehow knew advance that the real star of Sticklepath - and in fact the whole day - was going to be the other pub, the Devonshire Inn. And I was entirely right - I immediately fell in love with the Devonshire Inn as soon as I walked in. It can sometimes be a little difficult putting my finger on what exactly makes such a perfect pub. Absolutely the worst possible fate that can befall a pub is modernisation. The merest hint of a Farrow and Ball paint job and I immediately lose interest. However there are also places which have avoided that terrible destiny but didn't have a particularly appealing decor in the first place, have never had much care lavished on them, and now look rather run down and tatty. Somewhere in between though, or possibly existing on a different axis altogether, are pubs which have beautiful interiors that haven't changed for decades, or even centuries, and have clearly been cherished by landlords and customers alike. Unspoiled, but not unloved either. The Devonshire Inn exists on this magical plane of pub heaven. I stood at the bar, and was served by a lady who could well be in her 80s. The beers are served directly from stillage behind the bar, and despite the glorious weather outside there was a roaring open fire. I immediately became ensconced in conversation with a couple of the regulars, and I'd have been very happy to just stay here the rest of the day, but eventually felt I ought to press on with the rest of the itinerary, so reluctantly headed back outside, in the direction of the next village, South Zeal. Before I'd left Sticklepath though I had a call from Dad, to say he had now arrived at South Zeal. I originally said we were going to meet there, but having loved the Devonshire Inn so much I wanted Dad to see it too, so in fact I got Dad to come for another pint there. He of course loved it too, although there was by now was a "rowdy" group (of gents in their 60s and 70s) so it wasn't quite as idyllic as it had been when I was there. From there we headed on to South Zeal, for the final two pubs - the Kings Arms and the Oxenham Arms. Both decent enough pubs in their own right (the latter being more of a hotel) but the Devonshire Inn was just a very hard act to follow. We left South Zeal around 5:30 or so, and drove to Dad's house, where we had homity pie for dinner. Picture of the Barbour waterproof coat I bought yesterday for my walk on Dartmoor. Found myself craving a curry, so after leaving the office and doing a bit of shopping in preparation for my upcoming walk on Dartmoor, i went to Woodlands for a thali. Went with some colleagues to try Noble Rot, the new (ish) wine bar in London which everyone seems to be talking about at the moment. Had a couple of Gevrey Chambertins. Although the girls were staying on for another week-and-a-bit, I flew back to London today. In many ways the main event of this trip to Japan (and my last full day) - Kanako's wedding. Got the shinksan from Hiroshima to Tokyo, which took up most of the afternoon. Dinner at a vegan restaurant in Shibuya. Last full day in Hiroshima for me on this trip. Didn't really do much in the daytime - just a trip to the mall in the afternoon. In the evening we went out for sushi with Erika's Great Grandmother. Spent the daytime in the centre of Hiroshima. As has been a theme most of this week, in the morning the main thing on my mind was trying to find a decent coffee. This has been met with mixed success, and today was probably the biggest failure of all. Bean Hunter seems to be the incumbent global authority on where to find good independent coffee shops serving espresso based drinks, and I noted that whilst Fukuoka had a few places listed, Hiroshima (at least the city proper) had nothing. So I tried a different tack and searched for "La Marzocco Hiroshima", which suggested Obscura Coffee. It looked very promising, so on arriving in the centre of Hiroshima this morning we went there, only to discover a sign saying no children are allowed inside. They also apparently couldn't do a macchiato to takeaway "because it's too small" so I left feeling rather annoyed, with a distinct impression they just didn't want my custom at all. Whilst I appreciate that some people want to have a bit of peace and quiet when they're having a coffee, and probably don't want small kids spoiling the ambience, at the same time on a weekday, in the daytime, when most people are at work, the mainstay of customers are almost certainly going to be stay at home parents with their kids (at least that tends to be the way of things in London). Also when this appears to be the only decent looking independent coffee shop in Hiroshima it's more than a bit frustrating that they have this rather backward, unwelcoming attitude. Back at home in London we have two local cafes almost opposite each other and there's kind of a tacit understanding that one is for people with kids, the other is for grown-ups who want peace and quiet - although even that place doesn't explicitly ban children. I noticed with some relish the cafe was completely empty, and having been about to add them to Bean Hunter so there would be something listed in Hiroshima, I decided just not to bother as I don't think they deserve any additional custom. I would be neither surprised nor upset to discover on my next visit to Japan that they'll likely have gone bust. After that I trudged rather grumpily through the streets of the centre of Hiroshima to "Kid-o-kid", sort of the Japanese equivalent of a soft play place, but with a bit more variety. I spent an hour or so there with Erika while Chie went off and did some shopping. Erika seemed to really enjoy herself - which cheered me up somewhat. It was lunchtime by then, so we went back to Nagata-ya, the Okonomiyaki place we'd discovered last time I was in Hiroshima, which is a lot more vegetarian friendly than the usual okonomiyaki places in Hiroshima, and also turned out to be quite kid friendly (they had a little child seat for Erika and the three of us were seated at the counter which was fun). We did a bit more shopping after lunch, with the aim of trying to find things to make for dinner, as I thought we should give Chie's Mum a night off from cooking. Somehow my suggestion to Chie and Yuka-chan that "we" should cook ended up with me cooking. I would have been more than happy if we were in England, I had use of my own kitchen and easy availability of all the ingredients I'm familiar with, but in Japan, with the added difficulty of trying to cater to Japanese tastes, and figure out what I can or can't buy in the shops here, it's always a real challenge. I managed to cobble together some kind of pasta dish which was just about passable, and the reception thereof improved significantly by a bottle of Gevrey Chambertin, and another bottle of more generic Burgundy. Second day of our two day trip to Yamaguchi prefecture, in the daytime we took a boat around Omi Island. Took Erika to visit the Anpan Museum in Fukuoka again. Went to see more family in Hiroshima - this time Chie's cousin, and her aunts and uncle. Fairly quiet day with the family in Hiroshima. Worked in the office in Tokyo in the daytime, then got the shinkansen to Hiroshima in the evening. Met up with Tanaka-san in Jiyugaoka in the evening. Worked at the office in Tokyo in the daytime. Having not had the energy to venture far from my hotel the previous day, today I determined I should go a bit farther afield, and visited some of my old favourites in Tokyo - Kamiya Bar in Asakusa, Ginza Lion in Ginza, and the vending machine bar in Yurakucho. We had decided to take Erika to Tokyo Disneyland on this trip to Japan, particularly as it tied in with their season of Frozen themed special events, and Erika loves all things Frozen. Unfortunately the weather was really bad, it pissed it down relentlessly all day, and it was a challenge to actually enjoy it. Another day in Tokyo spent mostly just trying to recover from jetlag. Alas we only had one night at the Park Hyatt (it was so comfortable, I was reluctant to leave), so after checking out headed over towards Tokyo station where we'd be staying in a brand new serviced apartment place for the next two nights. Lunch at the new vegetarian ramen place in Tokyo station, another nap in the afternoon, and then in the evening I looked after Erika while Chie met up with some of her friends. First day in Japan of this trip. Landed at Tokyo Haneda in the morning (first time for me to arrive there from London, much closer to the centre of Tokyo than the usual Narita), then got the shuttle bus to Shinjuku, and checked in to the Park Hyatt. Lunch at Al Dente, an old favourite of ours in Shinuku, then I had an afternoon nap while the girls went out to meet one of Chie's friends. In the evening we went to a kaiten sushi place in Shinjuku. Just one picture of breakfast at the airport before we flew off to Japan. Popped out to exchange some currency near the office this morning and noticed Little Ben had just been re-instated! 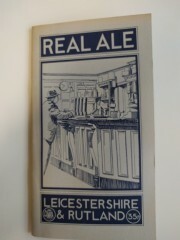 I'd found a copy of the book Dad wrote/edited online - Real Ale, Leicestershire and Rutland, 1977, and it arrived today. Chie and Erika both had dentist appointments in the morning, and as they're still registered with a dentist in Chelsea, this meant they came with me on the tube to work in the morning, and after they'd finished they came to my office for lunch, which was very nice. Erika had had vague symptoms of a cold the past couple of days, and had been mostly fine in the daytime today, but overnight was quite feverish. Spent most of the day with Grandma, and stayed fairly close to home. Chie headed out fairly early for a day in Bicester Village with Nozaki-sensei and Kaori-san, who were in England at the moment. In the morning we took Erika to the local soft play centre for a bit, and afterwards took Grandma on a little bit of a look round the shops of Kentish Town, such as they are, spending most time in the Owl Bookshop, which Erika seems to rather like. Then we had a pub Sunday roast for lunch, at the Oxford Arms, which had been decent in the past, but seemed slightly better than just decent today. Mum apparently rather enjoyed it, and I really liked the January King Cabbage I'd ordered as a side dish. Mum headed back just before dinner time, we had sausage and mash for dinner. Chie was out for most of the afternoon having afternoon tea with a friend. Mum was due to arrive in the early evening, after having spent the daytime today down in Guildford with Adrian, Liz and the kids. I wasn't feeling particularly energetic or inspired for things to do, so Erika and I didn't stray too far from home, and focused mainly on shopping to buy things for dinner with Grandma later on. Whilst out shopping I rather lazily proposed we go to the Wahaca in Kentish Town for lunch, which Erika seems to quite like, although I think it's more for the foosball table than for the actual food, which she only ever really nibbles at. When Chie came back I popped out again to buy wine for the evening, including a 2004 Pol Roger Blanc de Blancs, which I thought was rather delicious - rich and buttery which to me are classic Pol Roger notes (always reminds me of custard) - regardless of whether or not it was the most apt choice to serve with a vegetarian lasagne. I think had eaten quite a big lunch so wasn't particularly hungry anyway. I don't think I'd been to TGIF after work on a Friday since November, and so today, as a few of the usual suspects were actually going to be around for it, I decided to make a bit of an effort, and organised a mini Burgundy tasting. I bought four Burgundies from Jeroboams in Belgravia, with the obvious bias toward Gevrey Chambertin. Two I'd had before, and knew I liked already, and disappointingly one of the other two turned out to be corked but the final one (a 2007 Harmand Geoffroy Mazis-Chamertin) was very enjoyable. Didn't stay particularly late - there were around 7 of us, so we made light work of the 3 bottles, and I was back in time to put Erika to bed. Linguini with spinach and cheese sauce for dinner. Not much else to report. Lunch at Oliveto with Andrew. It was excellent as ever. Quick pint at the Duke of Wellington after work. Other than that nothing much to report. Ravioli for dinner, Erika's choice apparently. I'd been bothered for a while that Erika's bedroom didn't really look much like a kid's bedroom - being the larger of the two, and there not being much storage space in our bedroom, Erika's had been filled with large cupboards, and still had some moving boxes cluttering it up which were full of awkward things we didn't really need to have out, but couldn't really throw away either. So last weekend Chie had bought a sort of toy cabinet thing which we installed today in the space where all the boxes had been (the boxes are now cluttering up the lounge instead, ho hum). Anyway it really made a difference, and Erika's room suddenly looked a lot nice. After sorting out Erika's room in the morning, we layed with Erika's Sylvanian Families toys for a bit, then went for a Sunday roast at one of the pubs in Kentish Town for lunch (The Assembly House). We'd eaten Sunday lunch there once before, and whilst overall grateful a proper vegetarian Sunday roast option existed (i.e. something with potatoes and gravy) the actual centrepiece was very naff - essentially a very mushy splodge of sweet potatoes, with, oddly, some mushrooms in it. Anyway, I enjoyed being going in the pub for lunch with the girls regardless of the actual food on this occasion. Erika was going to a friend's birthday party in the afternoon, and since it only really requires one of us to accompany her (and she's generally busy with her friends once she gets there), I decided to have a bit of free time instead, and popped down to the George Inn in Borough. There in I met up with Andrew and Ricardo and the usual banter ensued. Chinese takeaway for dinner in the evening, of which Erika barely ate any having filled up on the proverbial jelly and ice cream at the party. Took Erika to the zoo for a while in the afternoon. Although the weather wasn't particularly nice, to compensate, after a long absence over the winter, thanks to it being half term the face painting lady was back. As it was wet outside I managed to persuade Erika to spend quite a bit of time in the aquarium and even the reptile house - the latter in particularly had not been a very popular option in the past. I was rather irked to learn that the Jackson's Chameleon gives birth to live young. I had come to terms with the awkwardness of the Duck Billed Platypus but somehow to have reptiles messing about with the rules like that just really wound me up. Given the timing (we didn't really arrive until almost lunchtime) we ate lunch at the zoo. It was exciting to see the new Lion enclosure was almost ready - I think by Erika's next visit it should be open. Headed back home after that and I popped out to our local wine shop (Theatre of Wine) for a bit in the afternoon to browse the Burgundies. Chie went out in the evening, so I stayed in to babysit Erika. Not much to report really. Quick pint after work at the Duke of Wellington - as it was a nice day for the time of year we decided to sit outside, ad were treated to an early evening view of the moon. Really nice now that it's not completely dark at 5. I'd been in a bit of a funk the other day and had attempted to remedy it with Internet shopping. For some reason I ended up buying a bunch of tweed accessories, which arrived today - A Harris Tweed wallet and pocket square (actually in matching tweeds, even though I bought them from different companies) and some tweed cufflinks. I quickly discovered the pocket square in particular doesn't really go with any of my jackets, so suspect I'll end up never using it, but it helped to pass the time at least. Iain, who I used to work with, announced he was moving to the US recently, so a few of us former colleagues met up this evening for a few farewell drinks at the Cittie of Yorke. We managed to get a booth, and although we didn't stay long the banter was of a good standard. Afterwards went for some Vietnamese food at Banh Mi Bay, which I didn't need as I'd already popped home first to have dinner with the girls before going to the pub, but I ordered something anyway so as not to be awkward. Ended up eating most of it, so effectively had two dinners this evening. Chie cooked Japanese food for dinner (although I don't recall exactly what). Not much else to report. Oddly enough, it being Valentine's Day, Chie had decided she wanted to go to IKEA, and mine and Erika's presence wasn't really required. So instead, having heard Kyle and Ralph were at a loose end, having been similarly abandoned by the woman of their household, Erika and I headed down to Dulwich for an afternoon play date. Superbly there's a single train from Kentish Town which goes all the way to one of the stations near where Kyle lives (admittedly not the absolute closest, but it didn't seem worth changing trains just to save five minutes or so of walking). When we arrived at Kyle's place, Ralph became quite upset, assuming I was a babysitter and therefore he was going to be abandoned. It took some reassuring, and pointing at Erika, before he relaxed. We went out for lunch not long after arriving at an Italian cafe/deli place near Kyle's place, which Ralph slept throughout, and with much coercion I just about managed to get Erika to eat some of a panini. In fact Ralph continued to sleep for a while after lunch, so rather oddly both Kyle and I were engaged with keeping Erika entertained, at which I felt a bit sorry for Kyle, who might have quite enjoyed a complete rest while Ralph was dozing. Eventually Ralph did arise from his slumber, and the two enjoyed playing hide and seek etc. We headed off round 4 or 5 (about which Erika protested quite a bit) and walked back to the station. Erika fell asleep on my shoulders, which was rather an impressive feat. As she hadn't been particularly cooperative in leaving in a timely fashion, we missed the train I was originally aiming for, so instead caught one which meant a change at Blackfriars. This was rather lovely as it meant we (or at least I, Erika being asleep) caught the sunset over the river from the platform which extends across Blackfriars Bridge.I had by this point successfully managed to transition Erika to my arms rather than shoulders, without waking her up, but she did eventually wake up as we were getting on the train from Blackfriars to Kentish Town. We had a nice chat on the train with a very sweet old couple, although Erika was a bit too shy/drowsy to say anything, and just clung onto my arm the whole time. food shop closed, as I had a bit of a craving to make Lebanese food for dinner, which somehow like a fittingly Valentinesy sort of thing to do - I don't know, Arabaian Nights or something like that. I made all the usual things - tabouleh, grilled halloumi, foul medames (well, "made" - it was from a tin) and also attempted foul moukala, which wasn't a great success (and reinforced the skill involved in the version they do at Ishbilia). We had the bottle of Chateau Musar I'd got as part of my Waitrose Wine order, and was reminded how much I liked it. Didn't venture very far from home at all today. Just went to meet a friend of Chie's (I think it was someone she used to work with, I lose track of Chie's friends a bit as she has so many) who has a son a bit younger than Erika at Bear and Wolf, and were there over lunchtime. Erika seems to have outgrown the playroom there a bit - looking at the other children there it does generally tend to be babies and 1 or 2 year olds, but not many kids 3 or older. She didn't seem to mind going back on this occasion though, albeit that she was more interested in having the books read to her than playing with the toys. Just went back home again afterwards, and had a pretty lazy sort of a day indoors. Chie and I have never really been into doing anything special for Valentine's Day, and I generally take the standard line of believing I'm railing against a cynical attempt to drive consumerism... that said though, the badgering about it in marketing emails etc, which nowadays seems to start almost a month ahead, obviously works on some level, as I feel a general compulsion to do something vaguely romantic around that time, although as some sort of inept protest usually not on the day itself. Which is a rather long winded way of explaining the rationale for having a bottle of Chateaue Lafaurie-Peyraguey and some strawberries (per the Brideshead Revisited recommendation) with Chie this evening. We'd had this combination once before (last February, as it happens), although on this occasion it was a different vintage of Lafaurie-Peyraguey (the 2010 rather than the 2001) and I'm not sure I enjoyed it quite as much. Perhaps we should have left this one in the cellar a few more years to let it mellow a bit. I had left work a bit early to pop to St. James's, half thinking of trying to get something nice for dinner from Fortnum and Mason (wherein I actually only ended up buying the strawberries, which despite being entirely out of season were apparently English and rather fine looking specimens), plus also to go into D.R. Harris, to buy some new shaving things for me, plus a little Valentinesy sort of present for Chie (some rose bath oil, which apparently she really liked). Later on in the evening I took great satisfaction in re-organising my allocated part of the bathroom cabinets, and made a whole section of D.R. Harris things. Hmmm really don't remember anything about today! My old boss was in town this week (he who presided over the golden days of my approaching-a-decade with my current employer) and so along with another mutual friend from work we had a very pleasant evening out in King's Cross / St. Pancras. We started with cocktails at the Gilbert Scott, and I was really impressed by the rhubarb gimlet, which had a fantastically fragant aroma, particularly toward the end of the glass (who'd have thought there would be such a bouquet just from rhubarb?). We followed that with dinner at the German Gymnasium, which opened in the latter half of last year, and had been generally panned by the critics. I have to admit I sort of agreed with them on the food, which wasn't particularly impressive, but the setting was really nice, and it was also an opportunity to continue yesterday's theme of Pinot Noirs from outside Burgundy, in this case a couple of really good German Spatburgunders (the German name for Pinot Noir) - particular the Weiler Schlipf 2012 which I thought was very pleasant indeed. My recent love affair with Burgundy reds had made me curious to try Pinot Noirs from a little further afield, and I was absolutely delighted to discover there was in fact an English Pinot Noir, Bolney Estate, which had actually received some fairly good reviews. So I had ordered some from Waitrose Wine, which meant slightly irksomely I'd had to order a mixed case of 6 bottles (oh calamity! ), and so had also picked some old favourites and some other new things to try. Conveniently I was able to collect this from the Waitrose in Camden, although lugging 6 bottles of wine home on the bus at rush hour is not necessarily something I'd advise. Tonight I was very keen to try the English Pinot Noir and so that was the first to open from the case. It did not disappoint, it was on the light side (but recently that's how I prefer red wines to be anyway) and really elegant. It was quite a momentous occasion really - a decade ago, before the rise of the greats like Nyetimber, it was hard to imagine anything positive being said about any English wine, and now having successfully conquered sparkling whites, reds seem like the new frontier. I left work a bit early today to make Chinese food for dinner, as is the default on Mondays, including Erika's favourite duck (well, pretend duck) pancakes. Erika had apparently been a bit challenging in the daytime so Chie was really glad I was home early to lend a hand. There are several pictures we'd bought back when we'd lived in our previous flat that we'd never got round to hanging up on the walls, thanks in part to the slight hesitation I always felt about banging nails into the wall in a rented flat. So one of the really nice things about owning our place was the impunity to do as much of this as we felt like. That said, we had moved in almost a year ago, and still had a few pictures we hadn't got round to putting up, either because they needed framing first, or because they didn't have the necessary hanging wire at the back. The watercolour of Caol Ila Distillery, which I'd bought from the SMWS a few years back, fell into the latter category, but having bought a handy pack of assorted picture hanging paraphernalia at Homebase recently there was now no longer any excuse. So that went up on the wall in the kitchen this morning, and being a light coloured flamed and a fairly bright colour painting, in our very pale coloured kitchen, it looked really good. In the afternoon we headed down to Brixton for a play date with two of Erika's friends from her formery nursery, who we've kept in touch with. Erika clearly had a lovely time, despite an unfortunate toliet related accident early on in the proceedings (her friend very kindly lent her some of her spare clothes). Back at home in the evening I rather sacrilegiously paired a bottle of Gevrey Chambertin from Joseph Roty, which deserved a little more respect, with a Star Wars edition Cheesestring, as Erika happened to be eating one. I'd picked up a bag of "Punitions" from Poilane in the week, and very much enjoyed having a couple of these with an espresso from my coffee machine in the morning. I'm fairly sure the ingredients for punitions are just flour, sugar and butter. And yet they are absolutely delicious, and very moreish. Chie and Erika went to see Naoko-san and family over in Harringay in the afternoon, but I decided to leave them to it on this occasion, although did at least accompany them on the train on the way there so I could go to Homebase. The gate in the back garden keeps blowing open when it's windy, and it had been driving me slightly crazy - my attempts to attach a bolt to he gate had failed numerous times for different reasons. So today at homebase I bought yet another bolt and yet another drill bit, and ultimately this attempt to remedy the gate would prove not to be the last either. Still, on the plus side I also bought a handy pack of picture hanging paraphernalia, which would at least provide some satisfaction on the interior of the flat in the coming weeks. After returning from Homebase, and doing a bit more drilling, I decided to head up to Highgate, vaguely recalling that there was an independent wine shop there it might be nice to have a browse around. On arrival I was horrified to discover it had now been turned into an Oddbins. So instead I went for a quick pint at the Flask whilst I gathered my thoughts, then headed back home by way of Archway so I could instead go to my current stalwart Theatre of Wine. Rather lazily ordered pizza for dinner via Deliveroo, this time from a place called Bar Centrale. It wasn't great, but it wasn't terrible either. Not much to report really, I think we spent some time trying to decide where to stay when we'd be in Tokyo on our upcoming trip to Japan.